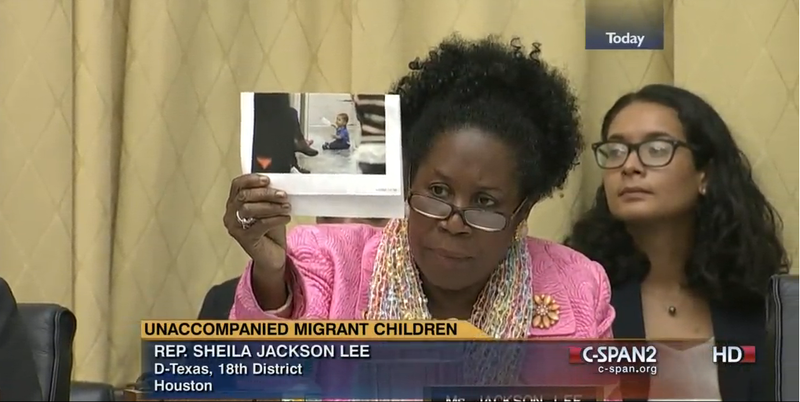 The title of the hearing revealed just how compassionless it was meant to be: “An Administration Made Disaster: The South Texas Border Surge of Unaccompanied Alien Minors.” Not children; just “alien minors.” This was a hearing that was intended to be used as a platform to attack the Obama administration, not discuss unaccompanied children. It is revealing that, in his opening statement, Chairman Bob Goodlatte (R-VA) noted only in passing that the “generalized violence” in Central America has “always played a role” in migratory decisions. But, in Goodlatte’s opinion, the determining factor behind the current crisis is the supposed ease with which unauthorized immigrants can get a free pass into the country without fear of deportation. Rep. John Conyers, Jr. (D-MI) quickly pointed out that Goodlatte’s line of reasoning makes no sense. If the Hondurans, Guatemalans, and Salvadorans currently fleeing their countries are only looking to get a free pass into the United States, then why are so many of them going to Nicaragua, Costa Rica, Panama, Belize, and Mexico instead of to the United States? And why aren’t Nicaraguans and Mexicans also flocking to the border to get their hands on this free pass? The logic of the nativist arguments about this crisis crumble in the face of such simple observations. Some at the hearing had no time for such concerns. Rep. Jason Chaffetz (R-UT) decried fraud in the asylum process rather than discuss the children as human beings. Witness Chris Crane, president of the National Immigration and Customs Enforcement Council 118, declared that the most “humane” thing we can do is to consistently enforce existing immigration laws (that is to say, deport all unauthorized immigrants, be they children or adults). And Brandon Judd, president of the National Border Patrol Council, denounced the “catch and release” of unauthorized immigrants and proclaimed that no “special status” should be accorded to any unauthorized immigrants—age notwithstanding. Rep. Jerry Nadler (D-NY) summed up the hearing quite succinctly, saying that it was a “farce.” It made light of a serious humanitarian crisis and used it to score political points. It belittled the children who are the victims of this crisis. And it illustrated just how cold a nativist heart can become—even towards a child.